The grammar of creativity combines design, color, sustainability, emotion, young solutions for lightness and originality: Skyline 2.0 Snaidero perfectly interprets all these ingredients, serving as a project easy to read. Appealing, technologically advanced, exciting, but also a versatile system suitable for small spaces in such large environments goes with the synthesis of a beauty clean, and functional, based on ergonomics, design and technology. At the base of the restyling of the two architects Lucci and Orlandini was confirmed the idea behind the project, according to which the design must be designed for the man in his entirety, in response to both emotional expectations an above all, functional and practical. Skyline 2.0 confirms a “outside the box” conventional project, released by the compositional grid modules that can highlight the clever use of space, both horizontally and vertically. 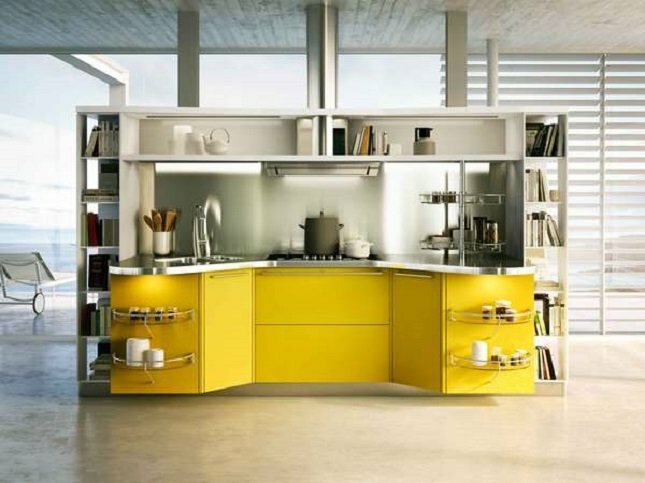 The work plan that modernized the design of the shape, confirms its extraordinary flexibility, along with a soft design, and continuously throughout the kitchen by creating a play of concavity and convexity that fosters an extremely ergonomic use of the operational area, with the advantage of overvaluation of the operative space. The end customer can draw your shaping choice of the work plan: from the point of view of Skyline 2.0 Lucci and Orlandini Design Industrial Snaidero can implement any type of form or design, adapting perfectly to the most refined requirements related to space or domestic habits. The project is also renewed in height: the need for more storage space and less infrequent contamination to the living, have in fact led the architects to bring the project to a new height come to define an operational area that doubles its space with two shelves countertop from which it was converted into a practical space to accommodate household utensils such as the kettle, kitchen tv, a Big W Coffee Machine , mugs and kitchen drives, allowing you to have everything at your fingertips. In this way, the devoted space of the preparation becomes a real console where everything is easy and accessible, thanks to the basics semi-space which guarantees perfect enjoyment of the area devoted to the preparation and cooking. The gestures and spaces are extremely soft as well as shaped by the work plan, including the two linear and curved countertop shelves with LED lighting integrated in the rotor angular compartment with two glass shelves, and bases projections, which are also equipped with storage shelves. But the customization is the true value of the project distinctive skyline 2.0, the kitchen where all combinations are possible, the composition, sizes and materials. There are over 100 finishes available for an aesthetic and functional dynamic able to support and enhance the creativity of the user. Everything is completely customizable: the doors, the floors above the shelves that surround the project chromatically by a distinctive and instantly recognizable sign.